A Delaware woman is recovering after police say her son dove in front of her when her neighbor broke into her apartment and opened fire. 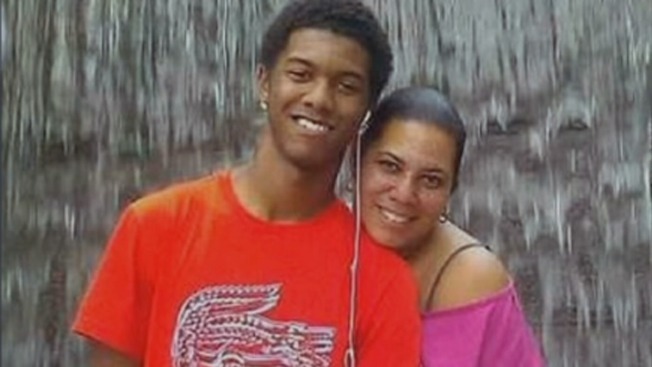 Patricia Buckworth, 40, was with her 19-year-old son Roderick on Tuesday shortly before 6 p.m. inside her unit at the Foxwood Apartment Complex in Pine Creek, Delaware. Buckworth told NBC10 her son had just returned from Wesley College in Dover, where he is studying criminal justice. As they were spending time together, police say their neighbor, 41-year-old Jason Brunson, broke into their apartment armed with a gun and immediately started shooting. With little time to think, Roderick pushed a dresser in front of the door and then jumped in front of his mother. The teen was struck twice, his mother once. After Brunson stopped shooting, the mother and son then ran outside and alerted a UPS driver, according to investigators. As police officers drove to the scene, Brunson shot and killed himself, investigators say. Buckworth told NBC10 that she never had any interactions with Brunson prior to the shooting and had no idea why he would target her and her son. Other neighbors also said they never knew Brunson, even though records show he had lived at the apartment for several years. Buckworth and her son were taken to Christiana Hospital, where they’re both in stable condition. Officials say one bullet was about a centimeter away from one of Roderick’s major arteries.